Who are the “Millennials”? There are are various ways to categorize us, but I’ll go with author Elwood Carlson, who defines us as people born between 1983 and 2001. I like this date range because it syncs up perfectly with the year I was born and the year I graduated high school. Under this demographic model, I’m lumped into the same category as people who were just starting to eat solid food when I entered college. That’s problematic for anybody who’s trying to understand how Millennials think and act in the digital realm. Now in their teens and early twenties, the younger Millennials are growing up with a version of the Internet that is far more social and mobile than the one I experienced at that age. I may be a digital native, but today’s youth are truly social natives. The first time I used social media was in 2004, when Facebook erupted on college campuses in the United States. It was something new and fun that you could do on the Internet, a mode of communication I had been using for years. But when the younger Millennials started using the Internet in 2009-2010, the social media boom was already in full swing. This is important, because their understanding of social media preceded and influenced their conception of the Internet itself. 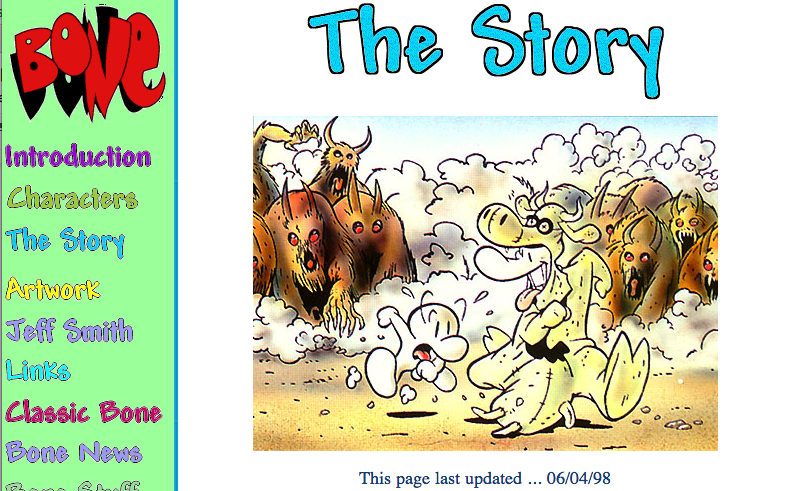 My first real contribution to the web was a Geocities site dedicated to my favorite comic book, Jeff Smith’s Bone. It was 1998, and I was 15. An archived version is available thanks to reocities, a monument to the early days of the World Wide Web. As you can see, I was a huge geek. Geocities allowed me to share my passion with fellow Bone fans all over the world, and I poured my heart and soul into crafting that image-heavy travesty of web design. I was creating something we now call “user-generated content”, a major characteristic of social media. However, the site itself was anything but social. Visitors couldn’t comment publicly, submit their own content, or form a community. Geocities was an empowering publishing platform, but it didn’t help me connect, collaborate, or engage with other fans around my content. Yet I didn’t even notice the absence of this functionality. I had a social blind spot. For a social native, collaborative content creation is practically the whole purpose of the Internet. People have always gone online to communicate with people who share their interests—that’s been true since the early days of Usenet. But social platforms such as Tumblr, Twitter, Youtube, Reddit, Pinterest, and Wikipedia have enabled people to share and remix each other’s ideas in ways that were simply not possible before. Social natives are born into a digital universe where cultural memes emerge, mutate, and evolve rapidly, where massive collaborative projects on Twitch and Kickstarter are the norm. And best of all, they can’t imagine not participating. The moniker “digital native” describes a person who has never known a world without the Internet. Similarly, we’re now being introduced to a generation that has never known a pre-social web. As a digital native, I had the luxury of naturally understanding a digital landscape that many of my elders needed to learn how to navigate. The same will be true for social natives: as the social web expands, fragments, and becomes even more interwoven with the fabric of our lives, they’ll intuitively grasp what the rest of us have to work hard to learn. It’s not that we won’t get it; it’s that to them, it will be obvious. Social natives are enthusiastic adopters of new platforms that older Millennials and Gen Xer’s are slower to discover, such as Snapchat. However, social natives do more than set trends. They have different ways of thinking, consuming information, and working together. One of the advantages that social natives enjoy is that they won’t have to unlearn bad digital habits from a pre-social era. For example, they don’t think of email as a catch-all channel for digital communication, unlike most people who came online before the turn of the century. And in contrast to some older Millennials, they’ve never relied on a single social network for all of their sharing. There was this one teen girl I talked to, a total One Direction fan. Twitter was her One Direction space. What that meant was that her friends all knew about her Twitter account, but they weren’t into One Direction, so they weren’t on Twitter with her. But they all were on Instagram together because that was a fun place where they were sharing photos… Meanwhile, they were also doing crazy things on Tumblr, where they were part of a little maker community. In contrast, I had to learn the hard way that you can’t use a single social profile to express every aspect of your personality. My expectations for social media were defined in college, when my entire social scene was on Facebook. For years afterward I continued to share everything on Facebook, from family photos to political opinions. My family, college friends, and professional colleagues all got the same, undifferentiated content. Now I supplement Facebook with multiple Twitter profiles, through which I engage with different communities around different interests. We can all figure this stuff out, but social natives get it already. Why does this matter now? Because whether you realize it or not, the youngest people in your office are social natives. The first of them just recently started graduating from university, but more are coming—soon, if you were introduced to the internet in the pre-social era, you will be in the minority. Inevitably, the assumptions and habits of social natives will be the norm. Social media is rapidly changing how people communicate in organizations by making it easier to share and discover knowledge. Consumer-oriented social networks such as Facebook have mainstreamed several new communications norms, including activity streams, message tagging, and follower lists. These conventions have since taken the enterprise by storm. Now, business ideas can take shape as rapidly in a Yammer thread as dinner plans come together in a Facebook group. Social natives understand this collaborative process intuitively, because for them, it’s been a staple of the Internet since day one. Of course, familiarity with social media for personal use doesn’t always translate into workplace productivity. Enterprises should help social natives manifest their natural inclinations in the most effective ways, by supporting younger employees with training in social business skills. However, if we want to take advantage of the $1.3 trillion social economy, it’s time to let the social natives teach us, too.